From a home theater experience on a tablet to the growing market for "phablets," leading technology companies discussed the next big trends at the International Consumer Electronics Show in Las Vegas this week. Executives from Qualcomm Inc. (Nasdaq: QCOM), Samsung and Facebook (NYSE: FB) sat side-by-side at a "MegaTrends and Mobile First World" panel on Wednesday to predict how mobile, social, cloud, content and devices will converge for new services. The panelists each voiced their opinion about the market for big-screen smartphones. 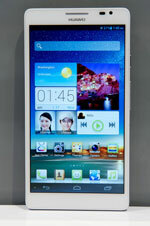 Competitors of Samsung's 5.5-inch Galaxy Note II smartphone were revealed at CES this week: Lenovo's 5.5-inch IdeaPhone K900 and Huawei Ascend Mate 6.1-inch smartphone. There’s “no magic number” in terms of the right screen size, said Kevin Packingham, chief product officer for Samsung Mobile USA. The original Note was launched globally in 2010 and the next, the Note II, was unveiled last year. Some of its prime customers include lovers of multimedia content or businesspeople who want to use the device for email, as well. “There is a segment of users that will find that extremely appealing. Samsung’s goal is to make a broad enough portfolio so that users have a choice about what screen size is right for them," he said. Glenn Lurie, president of emerging enterprises and partnerships at AT&T (NYSE: T), doesn't prefer to hold what he calls a 6-inch “frying pan” to his ear, but he's not the demographic smartphone device companies should focus on. Anand Chandrasekher, chief marketing officer at Qualcomm, said even analysts tracking the big-screen market can be wrong, recalling one who called a 5-inch device a "ham sandwich next to your ear." China is a marketplace where large screen displays sell well, he notes. “So there is huge opportunity,” said Chandrasekher. Moderator Rajeev Chand, managing director and head of research for Rutberg & Co., asked whether Packingham was nervous about competing with the latest large-screen phones announced at CES. He said Samsung doesn't point to a single competitor; it's concerned about everyone. "It’s the DNA of Samsung. We are an extremely competitive company and are constantly looking at the ecosystem to figure out how we can build better products," he said. "It’s what drives us every day to be the best in the product categories we are in." Samsung holds the title of the No. 1 manufacturer of Android devices in world. “We have a great partnership with Google. We continue to innovate together and want to continue to build that partnership to build great devices," said Packingham. He hinted at upcoming promotional opportunities with multiple devices. “When you walk in with a Samsung Android device, you most likely look at a Samsung Android tablet, which is what a customer wants,” he said. Something else they want is the ability to hop on Facebook, anytime, anywhere. Vaughan Smith, vice president of corporate development at Facebook, pointed out that its mobile-optimized website, m.facebook.com, has more users than the Android and Apple apps combined. “Web is the biggest for us and it’s going to remain that way, we expect,” Smith said. Scrolling through Facebook is the No. 1 activity people do on Android phones, he noted. The aggregate of Google Maps and YouTube takes up 12 percent, while the aggregate for Facebook is 17 percent. Samsung and Apple Inc. (Nasdaq: AAPL) currently dominate the smartphone industry, but Chand posed the provocative question of who might unseat Packingham -- Samsung in general -- in four years. "Samsung has done phenomenal job," said Lurie. "The next great device is a question we all get asked that Qualcomm and I talk about a lot." Chandrasekher said the answer isn't that simple. “If history teaches us anything, in the technology marketplace, when you lead with technology that matters to the consumer, you win,” he said. Samsung and Apple have done "stunning" jobs at that, he said, and that’s why they sit at the top. “In four years if you are looking at who is going to win, look at who leads with technology first. My bet is on immersive experiences on these devices and companies that are able to deliver that will be running away with a win,” said Chandrasekher. Qualcomm currently has the leading edge in the chipmaking space. Its newest Snapdragon 800 processors, which Qualcomm CEO Paul Jacobs announced at CES will be unleashed this summer in an array of devices, deliver Ultra High Definition picture quality. “If you walk around the show floor, that is the talk of the town, in TV. We are talking about it in tablets and smartphones,” said Chandrasekher. “That is an unbelievable capability. It gets cooler when you marry that with [7.1 surround] sound." He asked the packed room how many people own $25,000 home theaters in their home. Only a handful raised their hands. “If your home theater was your smartphone or tablet, would you would be interested? Hands are going up," he noted. Snapdragon 800-enabled tablets condense the feel of a traditional home theater with seven speakers. That means users can experience home theater-quality sound and video, while sitting on a bus or train with a headset on. "The feeling of seven speakers and the visual of being in a home theater," he said. "That immersive experience will excite the consumer." Conference attendees waited in line this week at Qualcomm's booth to get a taste of the experience in its Snapdragon 800 theater. “I bet you will walk away saying ‘I want that,’” Chandrasekher said. Lurie revealed another immersive experience consumers can look forward to: a connected car. AT&T has been working with auto partners to better connect cars with their drivers -- even when they aren’t near the wheel. “The expectation out there is everything is connected. The good news is we are seeing everything falling into that space,” said Lurie. For example, drivers can get a text letting them know their battery is running low or that the right tire on their 16-year-old daughter’s car is almost flat. “Cars become the smartphone to do that,” Lurie said. “Understanding what is happening with a vehicle. I think that is one of the coolest things that is going to start happening." Lurie thinks the "next big thing" is the ability to control all aspects of the home from a tablet or device. AT&T's Digital Life, a home automation and security system, is launching in eight markets in March and plans to hit 50 by the end of the year. AT&T spent the time and money to consolidate the features into one app, he said. “It’s the ability to unlock a door and turn off the water in your home,” he said. "Home is very personal – in your home you want to be safe and secure and see it when you travel." Playa Vista, Calif.-based Belkin is also creating new ways to connect devices in the home. The company's high-tech exhibit at CES featured a walkthrough model house staged with its accessories. Its suite of products automatically turn off the TV at kids' bedtime or let the iPad get the same reception in the backyard as in the kitchen, for example. The Belkin HD Bluetooth music receiver, a sleek and shiny black square, lets users stream music wirelessly into a home stereo system or HDTV. Users can tap the receiver with almost any near field communication (NFC)-enabled Android or Bluetooth smart device and their house is flooded with full HD sound. "This is a year people start to understand NFC technology and embrace it," said Packingham.